A television reporter does a standup as people are seen on the floor of the Republican National Convention at the Quicken Loans Arena in Cleveland, OH. Balloons fall, unplanned, from the rafters the day before the start of Democratic National Convention in Philadelphia, PA.
A woman picks up a shoe that fell out of her bag while walking the floor during the first day of the Republican National Convention in Cleveland, OH. A man walks over an anti-Hillary Clinton sticker on the last night of the Republican National Convention in Cleveland, OH. The private box seats for Donald Trump, Mike Pence, and their families sits empty before the start of the last day of the Republican National Convention. Buttons supporting Democratic U.S. presidential candidate Hillary Clinton sit on chairs for delegates at the Democratic National Convention Philadelphia, PA.
A man from the Virginia delegation cries as he watches a video about President Barack Obama, prior to Obama's speech at Democratic National Convention in Philadelphia, PA.
Texas delegates converse at the Republican National Convention in Cleveland, OH. 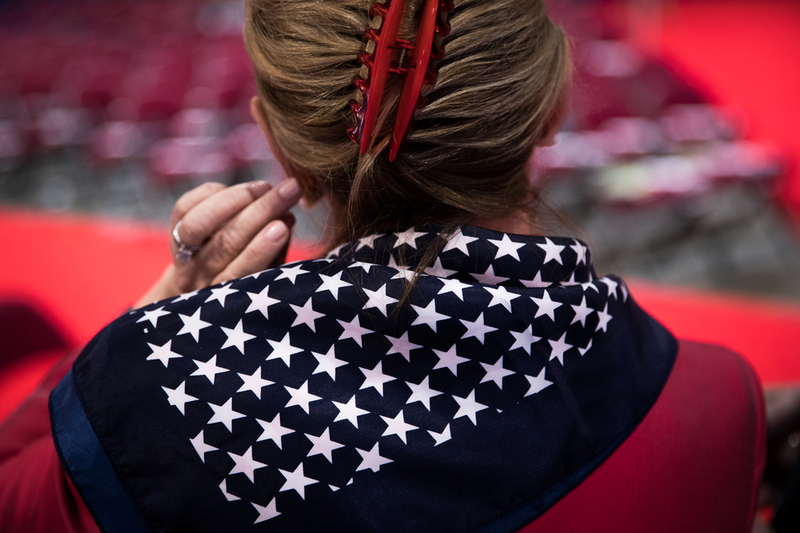 A woman fixes her hair at the Republican National Convention in Cleveland, OH. A protestor stands outside the security cordon of the Republican National Convention in Cleveland, OH. Delegates for former Democratic U.S. presidential candidate and Senator Bernie Sanders protest, occupying the media tents and requiring police response inside the security cordon of the Democratic National Convention. Republican National Committee chairman Reince Priebus and his family stand on the stage at the Republican National Convention in Cleveland, OH. 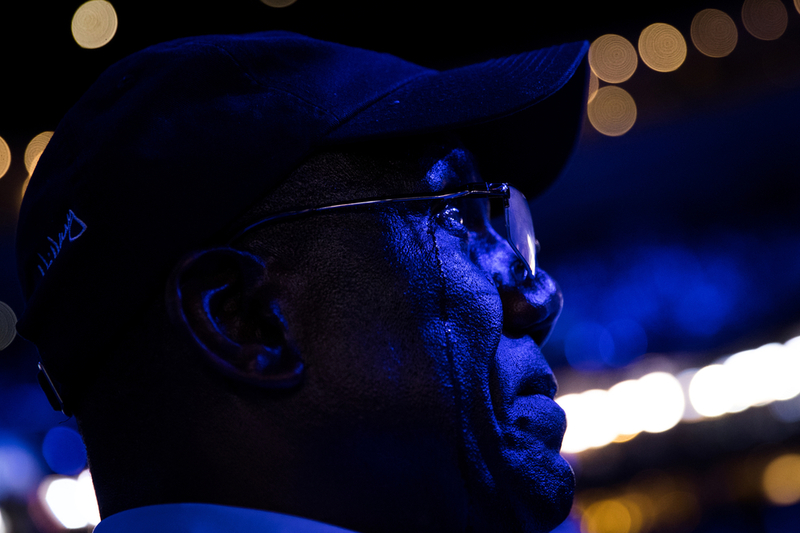 A Cleveland Police Officer stands guard while being photographed by a delegate at the Republican National Convention in Cleveland, OH. 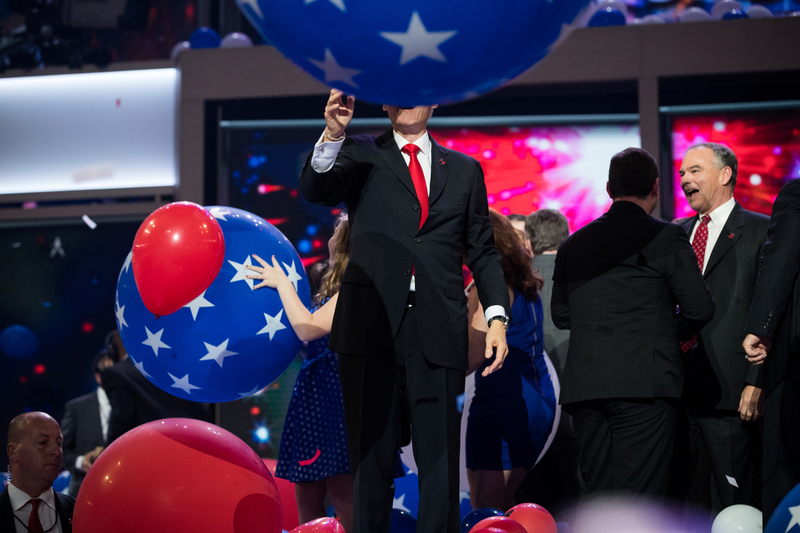 Balloons hang over the floor of the Republican National Convention in Cleveland, OH ahead of the end of the convention. Democratic U.S. presidential nominee Hillary Clinton is seen, remotely, on the screen after being nominated at the Democratic National Convention in Philadelphia, PA.
Republican U.S. presidential nominee Donald Trump and his family stand in a private box during the Republican National Convention in Cleveland, OH. Democratic U.S. presidential nominee Hillary Clinton takes the stage to accept the nomination of the Democratic National Convention in Philadelphia, PA.
A Missouri delegate, dressed as former U.S. President Abraham Lincoln, and a security guard watch the crowd of the Republican National Convention in Cleveland, OH. Pages for the Republican National Convention look at the crowd during the first day of the in Cleveland, OH. President Barack Obama and Democratic U.S. presidential nominee Hillary Clinton speak on stage after Obama spoke at the Democratic National Convention Philadelphia, PA.
A New York delegate looks up as confetti and balloons fall after Democratic U.S. presidential nominee Hillary Clinton accepted the nomination on the last night of the Democratic National Convention in Philadelphia, PA.
Former U.S. President Bill Clinton plays with balloons on the last night of the Democratic National Convention in Philadelphia, PA.
A man uses a urinal as balloons fill the floor of a bathroom on the last night of the Republican National Convention in Cleveland, OH.